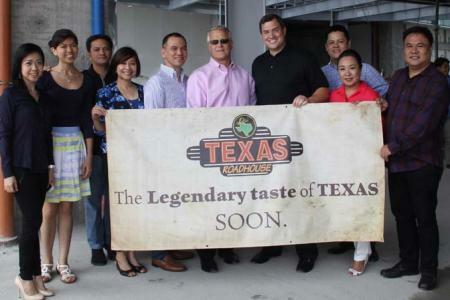 Less done two months before it opens its doors to the public, preparations are in full swing for the first-ever Texas Roadhouse in the country at the fourth floor of Uptown Mall at Bonifacio Global City. To ensure a smooth-sailing opening day, no less than Hugh Carroll, Texas Roadhouse vice president for international, flew in the Philippines together with Chris Colson, international director for operations, to meet with the local partners and the culinary team as well as oversee staff training. Foodies have The Bistro Group to thank for bringing in the brand, which is part of the company’s ongoing expansion plans for 2016. The Bistro Group is likewise pleased with the partnership. “We are equally thrilled to partner with Texas Roadhouse International and we are very impressed with what they did in the U.S. I believe that this will be a hit in the market,” said Paul Manuud, president and COO of The Bistro Group. “I think the value of the steaks we serve will be excellent and the quality of our products and level of service we provide will really distinguish us from the competition,” Carroll added. Aside from high quality beef, the restaurant also made history with its slow-cooked fall-off-the-bone ribs best paired with its award-winning Homemade Texas Red Chili. And while Filipinos love to eat their meat with rice, the restaurant’s freshly baked bread comes highly recommended. “Our bread is very special. We don’t make it fresh every day. Instead, we make it fresh every five minutes to maintain its quality. I think people will find this irresistible,” Carroll explained. Texas Roadhouse plans to introduce local flavors in the future but for the moment the restaurant is happy to bring to the Philippines its original menu that has made them a legend in the food industry, which includes sides made from scratch, salads, burgers and sandwiches, Country Dinners, Texas Size Combos, Chicken Specialties, Dockside Favorites, and desserts. Texas Roadhouse was founded on February 17, 1993, when Kent Taylor opened the first restaurant in Clarksville, Indiana. Kent’s vision was to have a place where people of all ages could have a great meal and great fun for a great price.